Answers to 450 common (and uncommon) questions about birds. Did you know that an extraordinary six million mallard ducks have been banded? And that an even more extraordinary one million of those have been recovered? Or that the female of a species, not the male, usually chooses a mate? Or that birds are hardly "bird-brained" but actually quite smart? This friendly, fact-filled browser is perfect for birders, bird enthusiasts, students and the curious. Accurate, comprehensive and fun to read, the author's answers reveal a compelling world of feathers, beaks, flight, mating, nesting, migration, sleep, song and much, much more. Why do many birds have dark wingtips? Why are our songbirds declining? Do birds ever fly backwards? Does weather affect migrating birds? Why don't ducks' feet freeze in winter? Are birds dinosaurs, or were dinosaurs birds? Why don't flying birds collide? Which senses help a bird find food? Do birds sing the same song all the time? Why do birds sing mainly at dawn? Are all eggs the same shape? The author's responses are informative, surprising and often entertaining, and the illustrations are appropriately lighthearted. This lively new book is a birder delight. 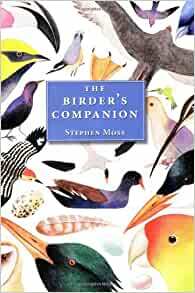 Stephen Moss is the author of several books on birds, including The Birdfriendly Garden and A Bird in the Bush: A Social History of Birdwatching. He lives in London, where he produces a wildlife series for BBC radio. Clive Dobson is a versatile artist and illustrator with many books to his credit, including Tex and Watersheds. He lives near Peterborough, Ontario. 5.0 out of 5 starsEveryone asks these questions about birds..well here are your answers. This is an excellent book about the birds everyone sees around them,often wondered about, and things they wish they knew. I have been an avid birdwatcher,or as we tend to call ourselves "Birders";and after over 20 years of Birding,and meeting many people who ask questions about birds;I was very impressed when I came across this book.It is definately not the book you are looking for to help you identify birds.If that is what you want,I would strongly recommend "Field Guide to the Birds of North America" ,published by National Geographic.I have written a Review on it and not only recommend it,but can tell you it is the best and most popular book for identifying birds anywhere in North America.Off all the books available to choose from,this should be your first choice. But this book is something else entirely.It answers 450 questions about the behavior and all those other questions that virtually everyone who even looks at birds in their backyard wondered about,but never seem to find answers. The book is written in very basic terms and easily understood.It answers many of the questions I frequently get asked by people when they hear that I am interested in birds. Why don't sleeping birds fall off their perches? How well can birds smell? Do young and adult birds travel together? How do migrating birds find their way"
Do birds pair for life? How do birds in a flock all turn at the same time? Do birds ever fly backward or upside down? Where do most birds live? How many species of birds are there in North America? As you can see,that is just a sample of the 450 interesting things covered about birds. So,if any of these questions ever occurred to you,this is a great book to find the answers.It is also a great book to get along with any book that shows you how to identify birds,because even if these questions never occurred to you;they certainly will if you develop any interest in birds.